While May was Military Appreciation Month, Omni Financial and countless other businesses, organizations, and media outlets show their support to America’s heroes year-round. From intimate local gatherings to large national events, people are happy to express their gratitude to our troops. For example, on June 7, Omni held a Car Wash Event at Fort Bliss. 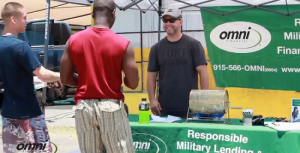 Military members were invited to get their car washed for $1. Here are just a few other military appreciation events that took place around the country within the past six months. ACM All-Star Salute to the Troops – On Tuesday, May 20, country music superstars including Blake Shelton, Carrie Underwood, Florida Georgia Line, and many others paid tribute to the men and women serving in our Armed Forces during the ACM All-Star Salute to the Troops. Some of the highlights of this nationally broadcast event were the powerful stories of individual service members and the duets performed by active-duty military and stars. Watch as Officer Baily Zimmerman sings Red High Heels with Kellie Picker. AT&T Pro-Am Military Appreciation Day – On February 5, the AT&T Pebble Beach National Pro-Am, a popular spot on the national PGA tour, held a Military Appreciation Day. Service members received free admission plus special access to the traditional 3M Celebrity Challenge which gave them an opportunity to meet celebrities from the worlds of sports and entertainment who were playing for local charities. Clay County Chamber of Commerce’s 2014 Military Appreciation Luncheon – In May, military personnel in the Northeast Florida area were invited to a luncheon at the Thrasher-Horne Conference Center. Rep. Ander Crenshaw (R-4) of Jacksonville was a speaker at the event that honored the work of the military overseas and in the local community. Petty Officer and Yeoman 1st Class Kathie Scott and Aviation Structural Mechanic 1st Class Jared White were awarded the VyStar Award for Military Excellence based on their service above and beyond the call of duty and their commitment to their job and community. Hofstra Men’s Basketball Military Appreciation Day– On February 8, the Hofstra University men’s basketball team hosted a Military Appreciation Day. The team invited all active and retired military personnel to attend the team’s game against UNCW and gave them up to three additional free tickets, as well as a free beverage and hot dog or pretzel. Team fans who purchased a game ticket and made a $5 donation to benefit Operation Homefront Tri-State received a free limited edition Hofstra Pride Military Appreciation camouflage t-shirt. Fleet Week New York – The U.S. Navy, U.S. Marines, and U.S. Coast Guard were honored during Fleet Week NY, May 21-27. Approximately 1,500 Sailors, Marines, and Coast Guardsmen participate in this annual celebration that includes a variety of special events including the New York Mets/USO Military Appreciation Day at Citi Field, a Memorial Day Ceremony at the Intrepid Sea, Air & Space Museum, and local parades throughout the NYC metropolitan area. Fleet Week New York also gave the public an opportunity to take tours of visiting ships, listen to musical performances by Sailors and Marines, view aerial demonstrations, and enjoy many other military exhibits and activities. GovX.com – GovX.com honored a different military member or spouse on the homepage of its website every day during Military Appreciation Month in May. The website that offers shopping discounts for people who serve or have served in the U.S. Armed Forces, featured a photos and a short inspirational essay written by the Military Appreciation Honoree. Myrtle Beach Military Appreciation Days – In May, the entire city of Myrtle Beach, South Carolina held a month-long celebration thanking active duty military personnel, reserves, the National Guard, and veterans from all service branches. Local restaurants offered military discounts, a traveling Vietnam Memorial Wall was on display, and festivities included a parade, 5K run, picnic, and free military-themed Friday Movies. The Players Championship Military Appreciation Day – The Players Championship held in Ponte Vedra Beach, Florida continued its tradition of honoring U.S. service members with its annual Military Appreciation Day at TPC Sawgrass. The May 7 event featured award ceremonies, local dignitaries, and a performance by country music star Jake Owen. Active duty, retired and military personnel and their dependents were also entitled to complimentary admission to this PGA tournament. View this video to see more about this star-spangled event: http://www.news4jax.com/news/military-honored-at-the-players-today/25849712. Ski Resort Discounts – Shawnee Mountain (PA), Powder Mountain (UT), Cataloochee Ski Area (NC), Stevens Pass (WA), and many other ski resorts held military appreciation days throughout the season offering active duty military discounted or free admission. Stockton Thunder Military Appreciation Weekend– On April 4 and 5, the Stockton Thunder hockey team held a Military Appreciation weekend. Tickets were donated to the service members and their families and the spectators could view a moving tribute wall and video honoring local fallen military personnel. World War II veterans Dr. Leroy Leal, age 97, and Keith Cornell, age 93, were honored and they both were invited to drop a hockey puck onto the ice.